Cal Storm’s “Storm the City” viewing kickoff tournament was Epic. 98 different teams invaded the Misty May Treanor Training Sports Complex to show off their skills. This state of the art facility with ample parking and gourmet cuisine served host to some of the highest level basketball programs. Eleven different divisions spread out on fourteen courts gave the college coaches the opportunity to see a variety of teams from Colorado, Arizona, San Diego, The bay area, Nevada and local southern California. The event drew the attention of more than 70 Colleges. They ranged came from Universities up and down the West Coast such as Gonzaga, Seattle, San Jose State, to Pac 12 powers such as Oregon State and Cal. Universities such as Butler, Wichta State, UNLV, Texas Tech and Denver University were there so that they would not miss out on seeing some of the West Coast’s top talent on display. There was plenty of talent to be seen and all 4 divisions of college basketball were there to take a peek at potential players for their programs. Play in this division was dominated by the Chula Vista Panthers out of San Diego. Their relentless pressure and fast breaking style lead them to the division championship. The Cal Sparks gave them a great game by they too would succumb to the Panther’s pressure. Congratulations to this highly skilled and well coached team. This division was decided on the last day of the tournament in a hotly contested battle between local favorites Huntington Beach Waves and the host team Cal Storm Lightning. In the end the Huntington Beach team would pull away for a 10-point margin from the scrappy Cal Storm team. Was one of the most hotly contested division all weekend. 4 teams really stood out. The Fresno Heat, led by Coach Demetris Porter, brought out a strong team that gave teams fits. They play a fast pace and physical style that teams struggled to match. The second team that was intriguing was the SGV Blue team that dissects opponent’s defenses with precision passing and execution. Ultimately, they ended Fresno Heat’s championship dreams on Sunday. The third team, The Arizona Outliers, garbed in their Oregon Style jerseys, implemented a speed game. They brought out a huge crowd to support their efforts and they would not disappoint. They too would have their title hope ended by the team to watch in this division. The West Coast Dream! This team was a start-up program 2 years ago and struggled to get enough players on the court. Wow what a difference. They played great basketball and went undefeated all weekend. They handled all the pressure from more well-known programs and executed at the highest level. Great job coach and they truly deserved to win the championship. These next divisions drew good a look from the D2 and D3 coaches as they looked to get a head start on the D1 schools. Schools like Emerson, Carleton College, Cal Baptist, Cal Poly San Luis Obispo, Occidental, Pomona, and Claremont just to name a few, were looking to keep local talent at home. There were some gems to be found in the next few divisions. As the event progressed you could see coaches furiously taking notes and nodding in appreciation for what they saw. Another division that was highlighted by close games. On Saturday morning it looked like EJ Hoops, from Colorado, was going to be the team to beat. They beat a very good So Cal Wolfpack and then dispatched a good Balboa Hills team. The same could be say for the Fresno Lady Heat who had a strong showing Saturday. Sunday proved to be a very different case as the local Southern California teams bounced back from sluggish Saturdays the make their case for the championship. In the end, it was the one team that showed great consistency and the ability to remain calm under pressure. The Whittier Hawks took on all comers and won this highly contested division. Great Job Coach. Two fantastic teams carried this division. EJ Hoops and SGV were by far the two teams that all comers will have to go through gain any titles this year in this grouping. Both teams are excellently coached and have quality players that just simply put makes plays. These two teams are so evenly matched that the points for and against are only separated by 2 points overall. SGV has great outside shooting and fueled by their execution. EJ Hoops has horses to play with anyone, they exploit your weaknesses and make you pay for your defensive lapses. Looking forward to seeing these two top teams facing off in the future. This division received dominating performances by two teams, The West Coast Dream and Clovis North Basketball. Both teams won their games by comfortable margins. West Coast Dream putting up over 50 point 3 times in 4 games, while holding their opponents in the 30’s. Clovis North Basketball showed that the Central valley toughness that we have witnessed in the Fresno Heat style and other teams from that area. They only allowed their opponents to score an average of 21.5 points a game. A lot of young talent in this division. Okay I would not be a fan of basketball if I didn’t mention this game. It was a shame that a team had to lose. Clearly the game that had the crowd buzzing. The Cal Storm 15 National team, they won the division, versus Fever Basketball out of Northern California. This was an overtime game that highlighted a furious comeback from 15 points. The Cal Storm National team outlasting a great team in Fever Basketball 61-56. It took a 3 pointer to get them close and a steal to make the comeback complete as time ran out in regulation. This game had the whole facility watching. As one official said, who was refereeing the next court over, “The noise was so loud that we could not hear our whistles”. Now that is fun! The Fever coach wanted to run it back right then. True Champions always want another shot. The other team that also needs to be mentioned here is a GREAT Team EJ Hoops 15 U! These three teams went toe-toe in their games and dare all comers to come get some. Like all champions, the coaches from all three programs all asked run it back next tournament. Looking forward to see what it is in store of us next tournament and who else will join the fray. Will it be Las Vegas Storm National that calls next? They were the right there with EJ hoops before finally succumbing to the pressure losing by 12 points. This division was just fun to watch and the college coaches seemed to agree as they watch the up and coming players just ball out. Fresno State, Butler, Cal and others watched as these young ladies begin to take the game to a new level. Great games were played in this division. The eventual champions of the three pools each having to survive 1 point games. San Diego Lady Prospect had to survive two tough 1 point games. They defeated a tough Game Point Primo team 29-28 and a scrappy Cal Storm 17 Black 37-36. The white tigers were able to fend off a very tall and physical team in Long Beach Lady Rams 29-27 to hang on to the championship. The white tigers looked good all weekend. Joe Perry’s LA Net’s are a team that has yet to have a practice and still they were able to pull off a 3-1 record to capture the pool. Coach Perry does a great job getting his kids ready to play. I was fortunate enough to listen in to his post-game talk and he is a positive force in kid’s lives. Great job coach. Plenty of coaches such as UC Merced and Grand Canyon University to name a few took in the games to find that player that everybody missed. There was a plethora of talent and as the event progressed more chairs had to be added to this area. Every game was populated with college coaches looking to land the right fit. Early watchers were treated to some fun basketball. TVT, Cal Storm Knights, OC Monarchs, Academy White, Open Gym Premier and LA Conqueras looked like the teams to beat. They held court Saturday morning. TVT Purple and Academy White being pushed hard in their games, but outlasting OC Rhythm Blue and Balboa Hills Stripes. The Saturday game of note was the Cal Storm Knights vs. the OC Monarchs. Like two heavyweight boxers slugging it out these two powerhouse teams traded run to lead the game. In the end The Cal Storm Knights outlasted the OC Monarchs. TVT Purple were tested in 3 of their 4 games and showed the heart of a champion and pushed through to capture their pool. The Academy was able to hold off the runner up in their pool Open Gym Premier to capture the title. The one of the games that caught my eye was the last game of the day for this pool. Balboa Hills Stripes vs. Pasadena Swoosh Agility. Balboa Hills’ Coach Charlie Solomon down by 2 with 20 seconds left, orchestrated a masterful comeback, culminating with a 3 from the corner. While many spectators questioned why not just attack the bucket and tie the game, like a riverboat gambler, coach Solomon drew up the 3 and bingo 1-point win for Balboa Hills. A great game on both sides. This division had plenty of coaches watching them as they had really good size and shooting in this division. So teams looking for that outside threat or perhaps a project big were sure to find them here. Some really great basketball. The class of this division was the Lafayette Lightning from the bay area and EJ Hoops from Colorado. Both these team took care of business defeating the second place teams by double digits. Lafayette Lightning did stumble with a loss to Cal Storm National team but held off all other competitors. The Lafayette Lightning and EJ Hoops drew the attention of many of the college coaches as they have legitimate posts who are skilled and athletic as well as excellent guard play. This division was dominated by strong guard play. The guard play and the speed in this division was awesome. Many of the schools, like Azusa Pacific, Fresno State, Colorado State, Cal Baptist, and Macalester, were there to see if they could find that diamond in the rough and left with many notes about what they saw and players they needed to contact. All hoping to convince some lucky player that their school was the right choice. This division drew the most attention from the Mid Major and high D1 schools like Long Beach State, Cal, Colorado State, Oregon State, Hawaii, Gonzaga, Butler, LMU, Texas Tech, UCSB, Pepperdine, Washington State and Wichta State just to name a few. Each university looking for that one player who could have an impact. They would not leave disappointed. It would be a crime to start with anything else but Team Taurasi. They were the class of the tournament. With this being the start of the summer tournament season, nobody really knows what anybody has, who will gel and who will be the team to beat. 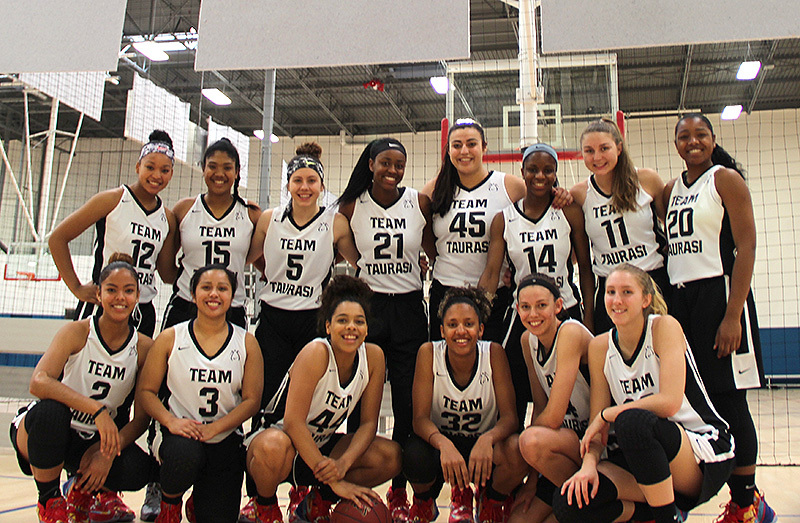 Team Taurasi has once again retooled for a run at the EYBL championship. Lead by Aubrey Knight and Taurasi holdovers Jasmine Jones, and Rayah Craig. That being said there was other talent in this division that had the college coaches drooling. Balboa Hill’s twins, the Fever Basketball’s guard play, and Cal Storm Bay Area size just to mention a few. I do mean a few because if you didn’t bring your A game in any of these games it was going to be a long day. Each team has players that will play D1 basketball next year.